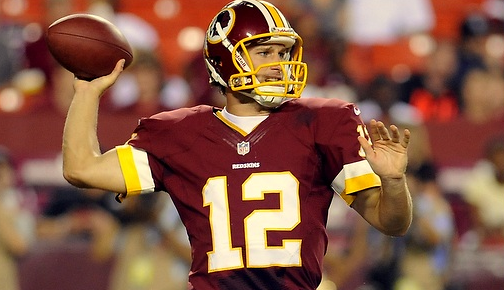 Suddenly, Washington Redskins' Quarterback Kirk Cousins is not so hunky in our eyes. With the recent coming out of NFL prospect, Michael Sams, making headlines for being the first openly gay football player in the NFL world, there have been some inspirational responses (We're looking at you, Dale Hansen!) while others have left us shaking our heads in disappointment. "So, from a football standpoint, if the guy can help us win, come help us win. Now, there are a lot of teammates in my locker room right now who may not have a homosexual lifestyle, but they have sins, too. They’re not perfect. So I don’t say they can’t help us win. Nobody’s perfect. While we commend the devout Christian for advocating an open arms policy and saying he would welcome a gay teammate, we can't help but notice that Cousins is comparing being homosexual to sinning, similar to that which his locker room peers commit. While Cousins doesn't specify which "sins" his teammates partake in, we can only imagine from the reputation that football players often have. Cheating, excessive drinking, etc., is on the same level as a dude loving another dude? But don't worry, gays. Pulling a page out of Miley Cyrus' book, he follows up with 'Nobody's Perfect'. How understanding of him!